If you’ve recently been diagnosed with environmental allergies you’ll do anything to feel better. Some people only deal with season allergy symptoms, but if you are allergic to dust mites or pets it means you likely experience symptoms year-round. I grew up with allergies. Unfortunately, I didn’t recognize that my symptoms were a result of allergies. I thought my itchy eyes and skin, sleepiness, and stuffy nose were “normal” and I learned to deal with the way I felt. It wasn’t until I was 30 that I was allergy tested and learned that I was allergic to a bunch of things, particularly dust mites. 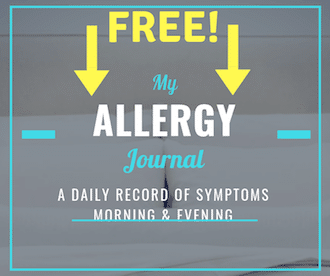 Have you ever taken antihistamines? Do you have pets inside? Do you or anyone in the home smoke? Do you know what a HEPA filter does? Do you use mattress and pillow covers? It was through these questions that I learned what should be done to make my home allergen-free. I was familiar with pet and pollen allergies but I knew nothing about dust mites. 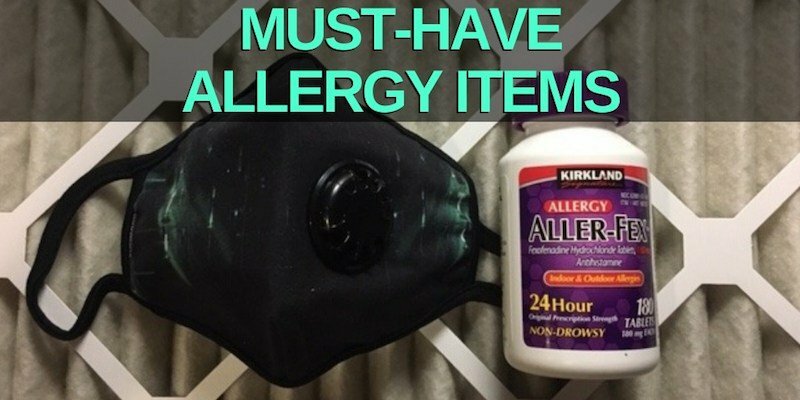 I had a lot to learn and thankfully a few items could quickly reduce my allergen exposure. Below are 7 must-have items for dust mite, pet, and pollen allergies. Antihistamine pills are a no-brainer and something that most people have in their medicine cabinet. If you experience allergy symptoms you’ll want to have antihistamines nearby to help reduce the allergic response. There are a number of over the counter antihistamines that work, but Allegra seems to help me the most. I especially like the fact that it’s non-drowsy so I can take it in the morning without getting tired (check Allegra on Amazon). If you’re allergic to dust mites and keep your pets inside, a daily antihistamine might be in order to keep your symptoms at bay. HVAC filters are in every home across America but they are something we rarely think about. If your family is like mine, they probably get a furnace filter from the hardware store where there are limited options. There are vacuums and there are vacuums with HEPA filters. HEPA stands for High-Efficiency Particulate Arrestance. Generic filters won’t capture those microscopic particulates from the air, but a HEPA filter is specially designed for those microscopic allergens that float in the air. When I was younger I’d vacuum the carpet in my room and I’d feel sick afterward. I never understood why until I found out I had allergies. The cheap vacuum that I used would literally blow allergens in the air and they’d remain airborne for hours (and I’d breath them in, thereby making my symptoms worse). Most of the big brands like Dyson use HEPA filters in their vacuums. Double check the description to make sure it does! People use bed covers for different reasons but they’re most popular for children who wet the bed. Waterproof bed covers work well for dust mites but they are extremely uncomfortable. They can make people sweat and they can make noise when you change positions. The best allergen mattress and pillow covers are microfiber or 100% cotton. They are breathable and soft. You might be surprised to know that allergen-proof mattress and pillow covers also help with pet and pollen allergens. Yes, over time pet and pollen allergens eventually find their way into your bedding where they can stay for years. Allergen-proof bedding will keep allergens inside an old mattress or pillow and it will keep new allergens from finding their way inside. I wrote about the best allergen-proof mattress and pillow covers and recommended a few. Earlier I mentioned how HEPA filters can help capture allergens when you’re vacuuming. HEPA filters are also used in air purifiers to filter your indoor air. In the 1990s and early 2000s, air purifiers had a mixed reputation. Did they really work? Would they really improve air? Early on, the answers weren’t so clear, however, these days there are high-quality companies that make HEPA air purifiers with allergies in mind. I wrote about a few of my favorite HEPA air purifiers in another article. Whether you’re indoors or outdoors, a mask can be really helpful for allergies. The problem is that many people use surgical masks and they don’t do much to block allergens. Finding a mask that filters each breath is important and there are a few brands that stick out. Vogmask has a bunch of options that are perfect for poor air quality in cities (check Vogmask selection on Amazon). They also work well for working inside (cleaning or vacuuming). I really like the fact that they look great. Who knew an allergy mask could have style? If you want a more industrial look, 3M is well-known for their quality masks. It depends on the season whether you’ll want a humidifier or dehumidifier. Allergies and asthma can get worse if the air is too dry or too wet. A humidifier will help moisten air in the winter when the air is dry. It might also be useful in summer, but only in dry areas of the U.S.
Dehumidifiers do the opposite of a humidifier and they remove moisture from the air. In humid regions of the country, a dehumidifier can be a big help to people who suffer from dust mite allergy. Dust mites love warmth and moisture and their reproduction increases in warm, damp environments. They don’t drink water, instead, they absorb all their moisture needs from the air. This is why dust mites are less of a problem in dry, arid areas. Dust mite allergies are unique because they occur inside our home. The mites are invisible to our naked eye and live in close proximity to us. Most people don’t know dust mites exist, while others may get dust mites confused with a pest we can see, the bed bug (read more about dust mite bites). Pet allergens are also invisible to our eyes, however, if there is a pet in the home you can count on pet allergens being present. Dander is what usually causes people problems. Dander is the combination of shed animal skin and their hair. Hair is heavier and usually rests on the floor, but shed skin can easily become airborne and linger in the air for hours. And guess what? Dust mites eat pet dander too, so your pets might be feeding dust mites! Indoor allergens often cause year-round allergy symptoms so people may not even think they have allergies. Like me, they may just think it’s their “normal”. I never knew how good I should feel because I never had a break from the symptoms. If you suspect you have dust mite, pet, or pollen allergies or if an allergy test has confirmed your suspicions, you’ll need a few items to protect you. Most people don’t realize it but our homes can be filled with allergens, even pollen that is supposed to remain outside. After speaking with my allergist I learned that my house wasn’t organized properly to control dust mites, pet, and pollen allergies. I didn’t use allergen-proof bed covers, nor did I use a HEPA vacuum or air purifier. I also had to research allergy-quality HVAC filters so my air conditioning wasn’t blowing around allergens. It only took a few steps to improve the air quality in my home and reduce the amount of allergens I was exposed to. In this article, I shared 7 must-have items for dust mite, pet, and pollen allergies. These items were a great investment for my long-term health and I immediately felt a reduction in my symptoms. If you’ve recently been diagnosed with indoor allergies I suggest talking with your allergist and improving your home environment. It’s amazing how a few small changes can improve your quality of life just like I experienced. Thanks for reading another Dust Mite Solutions article. Be sure to check the homepage to find more articles on dust mites, pets, pollen and overcoming allergies.